Constructed to honor past monarchs of the Chakri Dynasty, this magnificent stupa is 39-meter tall and 37-meter wide across the base with three floor levels. The lowest level houses temporary exhibitions while the second level houses a replica of the Buddha’s footprints and the third level, which is called “Hong Thong (the Golden Room)”, houses the holy relics of Buddha and his disciples. His Majesty King Bhumibol Adulyadej bestowed the name of “Phra Boromthat Chedi Maha Chakripipat” upon this stupa. 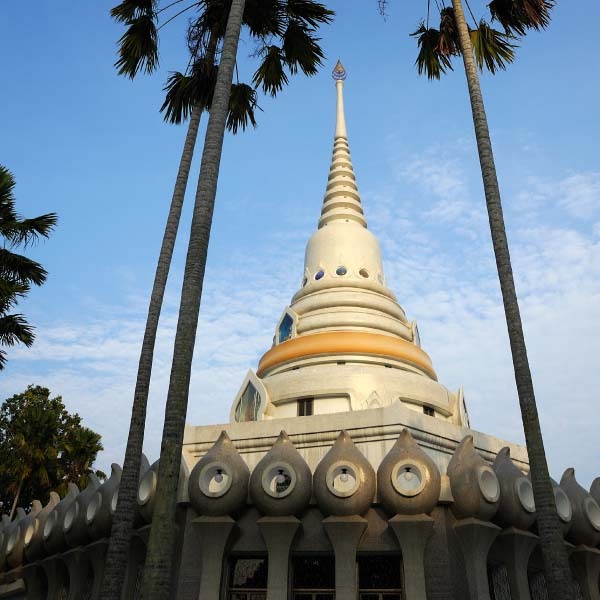 The name means “the Stupa that contains the Buddha’s relics for the progress and stability of the Chakri Dynasty”. His Majesty King Bhumibol Adulyadej and Her Majesty Queen Sirikit presided over the stone foundation laying ceremony of the Phra Boromthat Chedi Maha Chakripipat Stupa on 30 April 1982, which coincided with the 200th anniversary of the founding of Rattanakosin. Their Majesties also presided over a ceremony to raise three Phra Maha Chakri royal emblems to be placed permanently at the top of the Phra Boromthat Chedi Maha Chakripipat Stupa on 30 July 1985. Their Majesties again visited the site to perform the sprinkling of holy water, the anointing and raising of the gold umbrella to the Stupa’s apex on 28 June 1988.